Synopsis: Mohini-Bhasmasura is a beautiful story that tells how Mohini (Pushpavalli) uses her charm to save Lord Shiva from Bhasmasura, a terrible demon. Mohini is a female incarnation of the great preserver-god Vishnu. Vishnu's role in the cosmos is as the preserver of form and of balance. To meet his goals he frequently takes on fleshly form, often (but not always) human. While incarnate he retains his divine powers, but cannot be recognized by mortal eyes. Mohini is special, though, in that she is a male god in female flesh. Synopsis: The story is based on the discrimination against Harijans in villages. 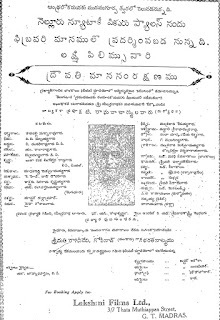 While some try to end discrimination, the Brahmins oppose it headed by priest Sunderarama Shastri (Subba Rao). His photographer son Nagaraju (Venkateswara Rao) falls in love with Shamapalatha (Kanchanamala), a Harijan girl and elopes with her to Calcutta where he teaches her to read and write. The two sects fight over water and work. After Shastri's wife is saved by the Harijans from a fire accident, his view of them changes. With the police and a few civilians, the situation in the village calms down while Nagaraju and Shampalatha are married with Shastri's blessings. Synopsis: King Brihadradha praying to sage Danda Kaushika to bless him with a child. The sage gave him a fruit that Brihadradha cuts into two pieces and gives to his two wives. They gave birth to two dead pieces of a child. Aghast, the King throws the pieces outside his fort. Deman Jara (Kanchi Narasimha Rao) finds them and joins the two pieces. The child breathes life and is named Jarasandha. 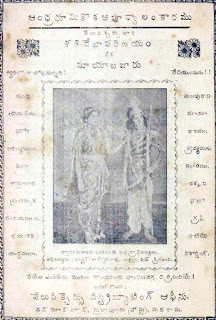 Trivia: NL Rangaiah was the first sound recordist in Telugu. Trivia: This movie was also known as JALANDHARA. 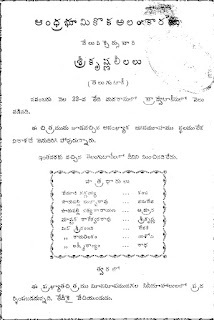 Trivia:This is the first social film in Telugu. It failed at box-office. Synopsis: Young Sasirekha, daughter of Balarama, finds a loving play-mate in Abhimanyu, son of Arjuna and Subhadra. Subhadra suggests to Balarama that Sasirekha and Abhimanyu would make a lovely couple, if married. Balarama falls in with the idea and promises to give his daughter in marriage to Abhimanyu only. After some years, having lost their kingdom in the game of dice with Kauravas, Pandavas are forced to go to Dwaitavanam. Sri Krishna comes to Pandavas and pacifies them with his soothing words and persuades Arjuna to send Subhadra and Abhimanyu with him to Dwaraka. During the course of conservation with Balarama, Revathi expresses disapproval of the proposal to marry Sasirekha to Abhimanyu, on the ground that the latter's father was bereft of kingdom and wealth. Synopsis: Draupadi and Arjuna meet Sri Krishna and invite him to attend their Rajasuya Yaga. Rulers of mani-fold Kingdoms arrive in their Royal splendour to the Yaga. The Mayasabha: a vision of enchantment. Merriment runs amok in endless entertainments. Proud Duryodhana is puzzled by the magnificent vision of the Mayasabha. Draupadi laughs at some of his mishaps. Duryodhana conspires to reek vengeance on Draupadi. His uncle Sakuni explains his plans of vengeance. 'Dhruva' was made and released by director C. Pulliah as a double bill with 'Sati Anasuya'. It was two mythologicals made exclusively with children and tells the stories of Bhakta Dhruva and Sati Anasuya. 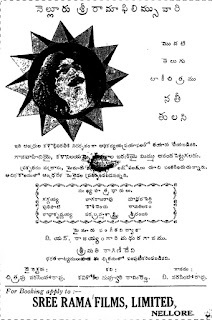 Trivia:This was debut movie for Kanchanamala, Rushyendramani, Lakshmirajyam and Relangi. Synopsis: Harassed by the evil deeds of Kamsa and his minions Bhudevi, Indra and other Devas offer their prayers to Lord Vishnu at the instigation of Brahma. Vishnu comforts them that he will be born as the son of Devaki and end their woes. Akasavani foretells Kamsa of his death at the hands of the eight child of Devaki, his sister. Kamsa becomes perturbed and tries to put an end to Devaki's life when Vasudeva, her husband, intervenes and promises to give away to Kamsa all the children of Devaki soon after their birth. Still unsatisfied, Kamsa imprisons Devaki and Vasudeva. Synopsis: Srirama after returning victorious from Lanka is crowned king of Ayodhya. Surpanakha and Karala, the only survivors of Ravana's family, come over to Ayodhya to wreak vengeance on Srirama. They hatch a plot according to which they take the forms of a washer man and his wife. Rama and Sita beguile their pensive hours viewing a series of paintings of the incidents of their past life. Sita, moved by wonderful reproduction of the peaceful atmosphere of the hermitages, requests Rama to let her visit the hermitages. Rama, though reluctant to send his pregnant wife to the forest, grants her wish. The disguised washer man and his wife put up a sham quarrel and speak very lightly of Sita's character. A spy of Rama listens to the gossip and reports to Rama the scandalous talk though reluctantly. Rama sacrifices his happiness as well as Sita's for the sake of popular opinion and determines to send Sita into exile.